-Gas Safe Reg'd. • Breakdown Repair & Servicing. • Fires Boilers Heaters &Cookers. Installation-Service-Repairs. • Combination Boilers. If you are wanting to rejuvenate your bathroom to make it both practical and aesthetically pleasing then you will want to ensure that you plan your bathroom perfectly. For bathroom features, such as shower enclosures, you will want to ensure you leave enough room for the feature itself plus a space next to it for easy and comfortable usage. Firstly you will want to consider the size of your bathroom and the size of each of the different features you want your bathroom to have. If you are planning on installing a shower enclosure you will find that there are numerous types, which are a range of shapes and sizes, including walk-in shower enclosures and D-shaped shower enclosures. When you know the different aspects you want in your bathroom you should then consider the amount of space you leave throughout the bathroom next to each feature to enable you to easily use each feature. 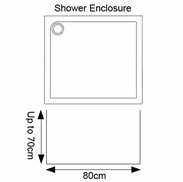 If you're planning on installing a shower enclosure we would suggest that you leave an area in front of the shower of about the width of the tray by 40cm-70cm. The area you leave in front of your shower enclosure can often be dependant on the type of shower door you plan to use, as different doors require different amounts of space to open. 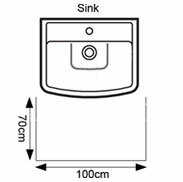 When it comes to bathroom basins it is best to leave a 100cm by 70cm area next to the basin so you can easily access the sanitary basin set. If you are planning to install a vanity unit you may want to leave a greater space next to your sink so you can simply access the storage. 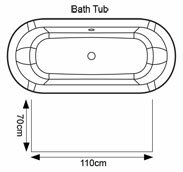 For bath tubs you should ideally leave an area of 70cm by 110 cm next to the bath where you plan to get in and out. 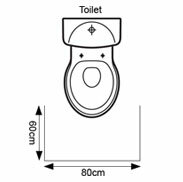 If your bathroom is going to have a toilet you will need to plan to have a space of 80cm by 60cm in front. Although you need to leave area next to most of your bathroom features for convenient use there is generally no reason why these areas can not cross over. There are also a range of other points that need to be considered including the space needed for your door to open, where your current plumbing is and the locations of vents and windows. Ensure there is enough room for doors to swing open.